It happens to me often that I have a recipe in my head since months before being able to shoot it and post it on the blog. But not everytime it is something that I feel I must do asap. Just because it is so good and it looks so pretty that I cannot just keep it for myself! 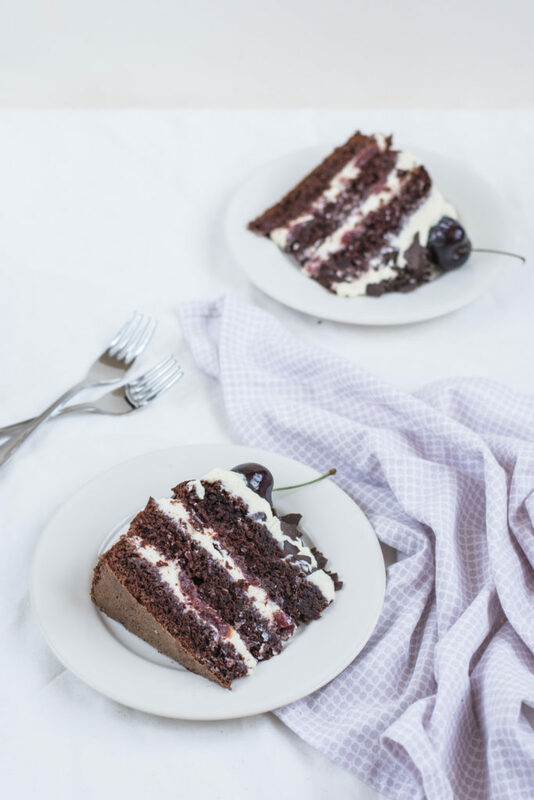 I remember how impatient I was for this Raspberry Swirl Cheesecake Tart, and this Black Forest Cake is something similar. 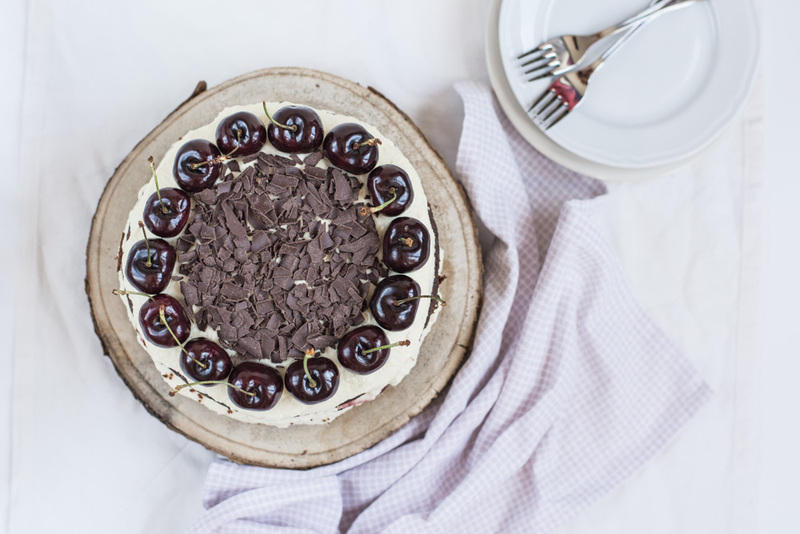 I have had this recipe in my head since March, but I was just waiting to have some fresh cherries for the shooting and as June was pretty busy, the recipe finds its way to the blog only now. And I tell you, get some cherries until they are gone and make it now! This cake is an immortal dessert that has always great success. 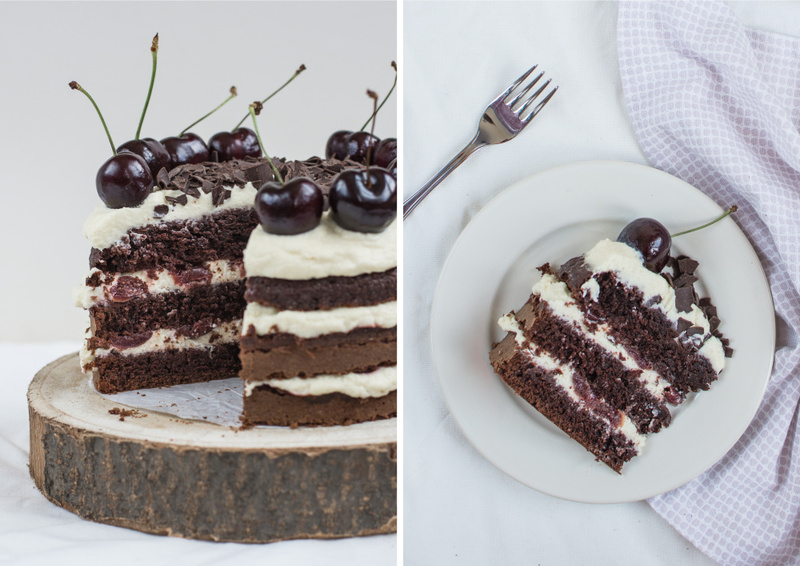 If you like chocolate and cherries, you will love it! You can also use sour cherries if you have. I went for normal dark cherries as they are now available on the market. Instead of a whipped cream which I used when I did this cake years ago, and that is in the original version of this recipe, I went for the mascarpone cream as per the inspiration at Call Me Cupcake and loved it. Unlike the whipped cream, it holds the layers well and does not melt that fast when being served. 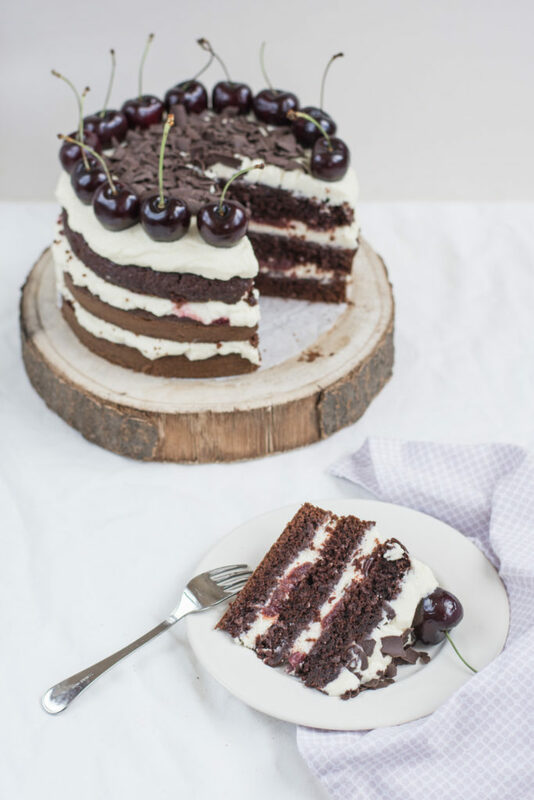 This Black Forest Cake is a three-layer chocolate cake with kirsch cherry syrup, mascarpone cream and cherries, decorated with chocolate and fresh cherries. Preheat the oven to 180°C. Grease and flour round cake mould** (or 3 different moulds for the layers). In a large bowl, combine the flour with cacao powder, baking powder, baking soda, salt and sugar. Add the eggs, melted and cooled butter, vanilla essence, sour cream, and eventually pour in slowly the hot water. Stir until the batter is completely smooth. Pour the batter in the greased and floured cake mould(s)*** and bake in the preheated oven for about 45 – 60 minutes (if you use 3 different moulds, then bake for much less time! ), or until a toothpick comes out clean. Let the cake cool down for 5 minutes in the mould(s), then remove from the mould(s) and allow to cool down completely. Take out the cherries from the compote jar and reserve about 100 ml of the syrup. Halve the cherries and if not pitted, pit them one by one, then pour the kirsch over them and set aside. Mix the reserved cherry syrup with the corn starch so that it dissolves well and there are no lumps. Pour it together with sugar and lemon juice into a small saucepan and bring to boil. Lower the heat and cook until the syrup thickens, stirring constantly. Add the cherries with kirsch and cook on a low heat for another 10-15 minutes. Let cool down and strain the cherries, reserving the syrup. Beat the mascarpone cheese**** and the powdered sugar**** on a low speed using a hand mixer. Add the heavy cream and beat on high speed until thick, but no longer than 2 minutes. Cut the cooled cake into 3 layers. 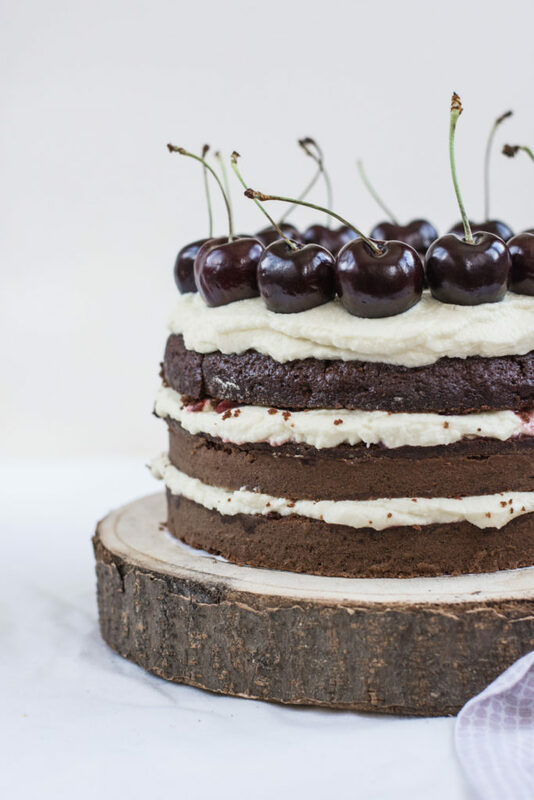 Place the bottom layer on a serving plate and spread with ½ of the thickened cherry syrup. When absorbed, add a layer of 1/3 of the mascarpone cream. Repeat with the middle layer – spread first with the rest of the cherry syrup*****, then with another 1/3 of the mascarpone cream. 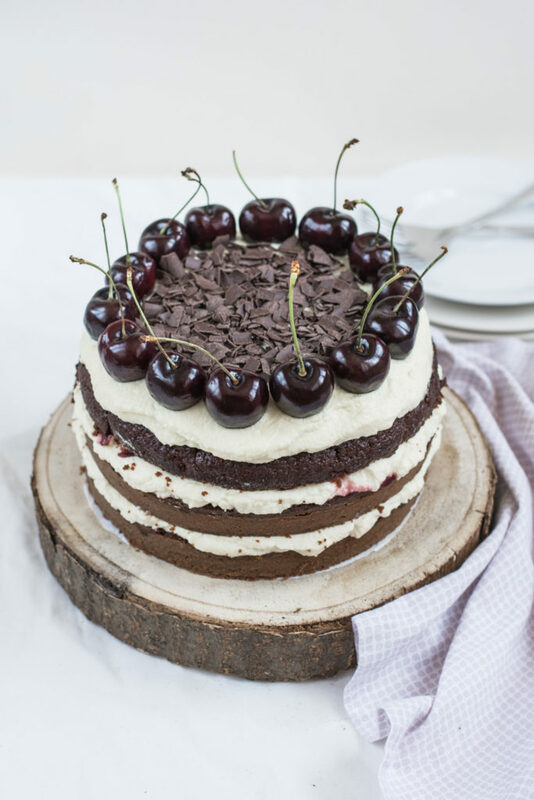 Add the top layer and spread with the remaining mascarpone cream*****, sprinkle the shredded chocolate over the top and decorate with the fresh dark cherries. Place the cake in the fridge and refrigerate overnight before serving. Serve cool. * Use the sour cream and eggs of a room temperature (just take them out of the fridge 30 minutes before use). **I used a cake mould of 19 cm in a diameter, but you can also use 22 or 24 cm, the cake will just be a bit lower; you can also use 3 different cake moulds for the 3 layers but in that case, you need to bake lower time than indicated. ***Pour the batter in the mould starting with the edges so that it does not swell out that much in the middle. If it swells though, then cool the cake bottom up on a plate or even cut off the swelled middle part so that the top layer is straight. ****For the cream, use cooled both Mascarpone and the heavy cream. 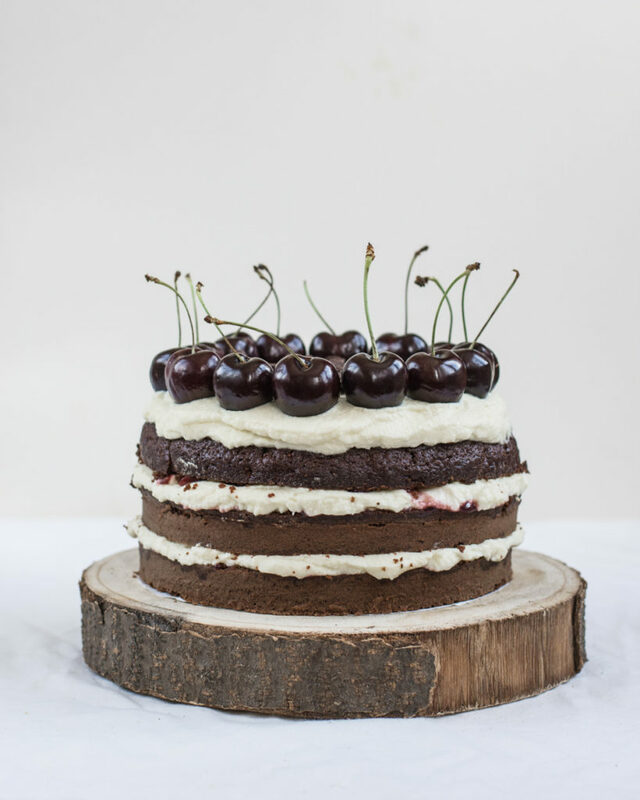 *****You may not use all the cherry syrup and the mascarpone cream if you use a smaller mould, just use layers thick as you like.